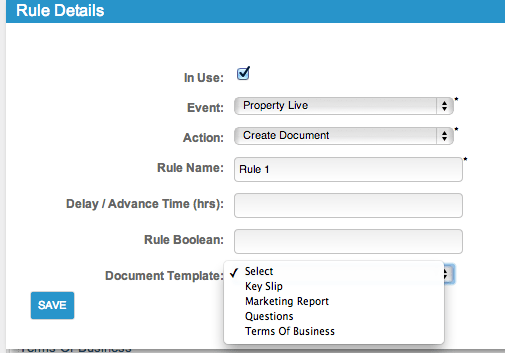 Rules are automated event triggers that can cause the system to perform actions based on predefined criteria. You can build rules as required by using the drop-down selection boxes. NB. Rules are processed in the order in which they appear in the list. You can re-order rules by dragging and dropping them. For example if you wish to create a proposal following a valuation and email it to the vendor, the rule to create the proposal must appear before the rule to send the email. More events may be added to the system from time to time. More actions may be added to the system in future. Depending on the event selected, the input fields will change to allow for logical parameters to be entered. The Create Document rule uses an existing document template from the Document Templates widget. For creating document templates, please refer to this article. Give your rule a name. This is mandatory and can be any name to enable you to remember what the rule does. Rule Boolean is a way of performing logic on the rule. Click to see this article for details. Finally, select the document template you wish to base your new document on from the drop-down list of templates available. Once you have created a new document using a business rule, you can preform actions on that document by creating further rules, like emailing it to people, etc. Please contact BDP for help with custom logic. This is beyond the scope of this help file at present. Email Applicant, Assigned Staff, etc. To trigger an email or SMS message to be sent based on an event, select the event from the drop-down list followed by the recipient. Give the rule a name. This is any name to enable you to remember what the rule does and is a mandatory field. If you wish to delay the sending of the email (or SMS), or to send it in advance of the event, choose the number of hours. Adding a – (minus) sign fires the event in advance, no minus sign signifies a delay. You can enter fractions of hours, for example -0.5 would fire the event 30 minutes in advance. A practical example of the above is if you create a viewing, the system will time-stamp the actual viewing time booked. You can then set a rule to send an email and SMS message to the applicant, say 2 hours in advance of the viewing. The logic is time stamp x (the viewing time) minus 2 hours is two hours in advance of the viewing. By the same logic, x plus 48 is two days after the event (the viewing in this example). The next input box is for any rule boolean. See this article for help. 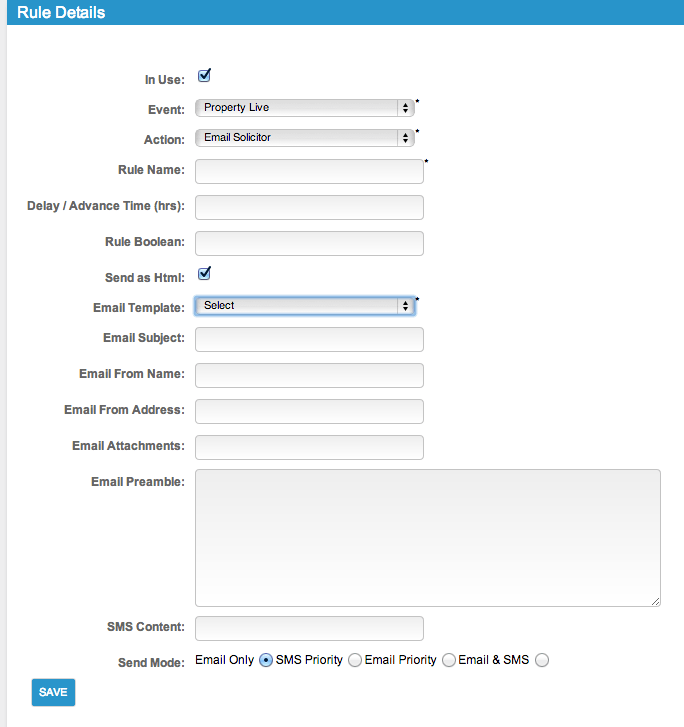 If you wish to send the email as HTML, tick the box, otherwise it will be sent as plain text. Next select the email template you wish to use as the basis for this email. Email templates are added to the Email Template widget in the Configuration > Configuration page. The drop-down list here will list all templates from that widget. Enter the “email from” name and email address into the next two boxes. There are pre-set attachments for the brochure and the Home Report which can be called by entering either “brochure” or “hReportPdf” into the attachments box. To attach both documents, separate with a comma, e.g. “brochure,hReportPdf” (without the quotation marks in all cases). If you wish to attach a custom document to the email you can put its reference number into the “Email attachments” box. The reference number of a document can be found by looking in the Document Templates widget in the Configuration page and hovering your mouse over the edit icon. A tool-tip will appear after a second giving the ID of that document template. If you wish to send multiple documents as attachments to your email, simply separate the reference numbers with commas. If you wish to send the documents as PDFs, insert a pipe (|) and the letters “pdf”. For example “432|pdf” will convert document ID 432 into a PDF and attach it to the email. It is possible that there may be several instances of a particular document, for example a standard form emailed to the viewing agent each time the property is viewed. In this case, prefixing the document ID with an asterisk will force BDP to attach the most recent version, e.g. “*432|pdf” would attach the latest version of ID 432 as a PDF. In the preamble box you can enter any default preamble required. In the SMS box you can enter the text required to be sent in any SMS message. One SMS can contain up to 160 characters – any more than 160 counts as a second message and you will be charged accordingly. SMS messages can contain placeholders – see the documentation for a list of available placeholders. Both – Both email and SMS will be sent.